White yarn: approx. 4 yds. Beginning with the four inch long cardboard wrap the 4 yards of yarn around the cardboard until it is used up. Gently slide the cardboard out and tie the bundle of loops in the center. You can use a drop of glue to secure your knot. Wrap the 11 yards of yarn around the 5 and 1/2" cardboard. Slip a scrap piece of yarn under the wraps at one end of the cardboard and tie the loops together tightly, again, using a drop of glue to anchor the knot. Slip the loops off the cardboard and tie an additional piece of yarn one and one half inches below the top tie to form the head. Clip the loops at the opposite end from the tie. Divide the loops in half from front to back, lift the front up and place the bundle of 4" loops across the center. Push up tight against the head. Bring the loose strands down and tie around the angel below the arm loops at the waist forming her skirt. Sew the piece of lace to form a tube. Gathering along one end tightly, stitch it to the angels waist at the back to form her wings. Use one pearl trim loop gluing it to form a halo. With your ribbon form a bouquet with the pearl strand and the remaining pearl loops along with the three ribbon roses and a three looped bow and glue it to the waist at the center front. 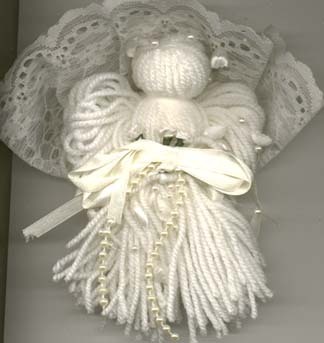 This can be used as an ornament or a package tie by adding a hanger loop to the top of the angels head or you can add a pin back to be worn as a broach.